NBC has set “Jesus Christ Superstar” as its next live musical, the network announced Wednesday. The new “Jesus Christ Superstar” will air on Easter, April 1, 2018, and will be executive produced by Andrew Lloyd Webber, Tim Rice, Marc Platt, Craig Zadan and Neil Meron. 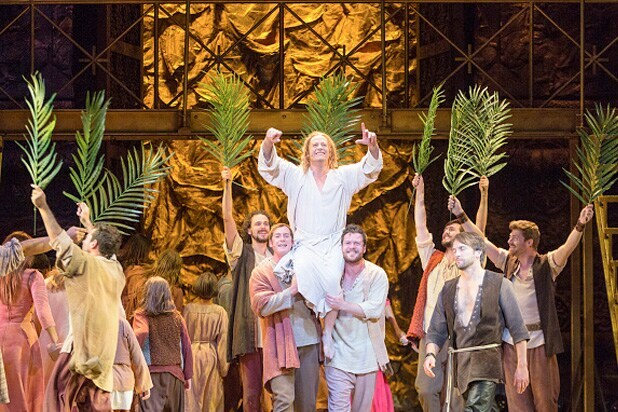 The musical is based on the final week of Jesus’ life. Other historical figures that play prominent roles in the production include Judas Iscariot, Mary Magdalene, Pontius Pilate, Caiaphas, Annas, Peter, Simon Zealotes and King Herod. The stars of "Supergirl" and "The Flash" get together to lend their musical talents to the Arrowverse's first musical episode. But "Glee" aside, Grant Gustin and Melissa Benoist are two-stepping down a road well-traveled. Here are some other great musical episodes in TV history. "Buffy the Vampire Slayer's" musical episode, "Once More With Feeling," was a watershed moment for the musical episode trope and has become a iconic in the years since, spawning fan screenings, sing-a-longs and even local productions. "Xena Warrior Princess" did not one but two musical episodes, though the first, "The Bitter Suite," is the one which has stood the test of time. "Love of Your Love" featured the singing talents of Lucy Lawless herself, and was nominated for an Emmy. "That 70s Show" did an all-singing all-dancing episode and naturally took advantage of all the great '70s music to create a jukebox musical facilitated by Fez's anxiety over an upcoming school talent show and whether any of his friends would show up to support him. Yes, even dark HBO prison drama "Oz" got in on the musical episode game, with an episode that featured inmates including BD Wong and JK Simmons showing off their musical chops in front of a microphone. "Community" has done countless episodes lampooning various other genres and pop culture references, so of course their musical episode was a send-up of "Glee," with Abed convincing his much more cynical friends to let loose and sing all their most innermost desires out loud - and maybe help Greendale Community College win regionals. "Scrubs" does many ludicrous things in the name of comedy, and the absurdist tone of the show worked well in its musical episode, where a patient at Sacred Heart had a rare and unusual condition where she heard everything through song. How convenient. "Supernatural" got meta for its inevitable musical episode, which also happened to be the show's 200th. That's right, 200 episodes. Of course, the episode had to be all about the show's passionate fans, and saw the brothers Winchester crash a high school musical production of "Supernatural." "Grey's Anatomy" once aired an episode featuring its cast singing various pop songs, including Chyler Leigh belting out a version of Anna Nalick's "Breathe." Curiously, Leigh, who now plays Supergirl's sister on The CW, is not one of the singers featured in "The Flash" musical episode. Shame. "Fringe" didn't waste any time getting to a musical episode, and did it in Season 2, where Walter smokes a particularly trippy string of marijuana and imagines a world where the characters are in a 1940s noir -- with singing and dancing. "Legion," the FX Marvel series, wasted no time in getting its musical on. The cast hasn't sung, but there was an extended dance number featuring the main characters in the very first episode, and by Episode 6, Aubrey Plaza was performing a one-woman dance number that blew people's minds. And we're only just halfway through Season 1, mind you. “Buffy the Vampire Slayer’s” “Once More With Feeling” is legendary, but did you know “Supernatural” also did a song and dance episode?